Indulge in ultimate luxury this holiday season with the Red Carpet Eyes and Face Palette, complete with a compact powder, two cream compact shades to conceal and contour, and 10 eye shadows. Perfect the complexion with the silky compact powder for a luminous, flawless finish. 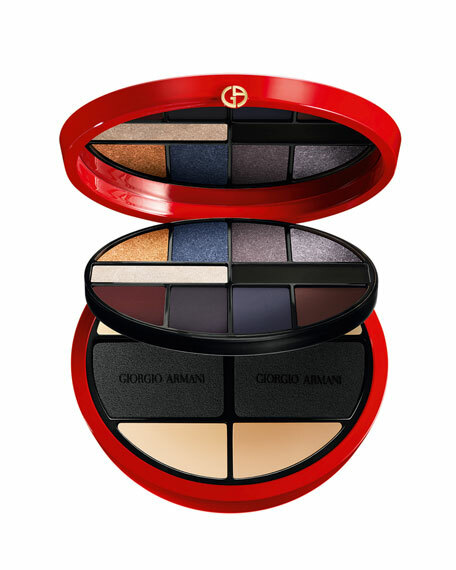 Use the compact cream shades to hide imperfections and/or contour the face. Dress the eyes for day or night with a navy smoky eye using the gorgeous selection of blue, violet and silver shades in both matte and shimmer finishes. Perfect the complexion with the silky compact powder for a luminous, flawless finish. Using the face sponge, apply the compact cream shades to hide imperfections and contour the face. Using the eyeshadow applicator, dress the eyes for day or night with a navy smoky eye using the gorgeous selection of blue, violet and silver shades in both matte and shimmer finishes. For in-store inquiries, use sku #2415251.